Standard Office Systems is committed to environmental best practices and partners with manufacturuers who are like-minded in this pursuit. Through our Toner Container Recycling Program, we do our part to reduce the carbon footprint that is left behind by teaming up with our Environmental Partners. Recycling: We utilize containers that are made mostly of plastic materials, making local recycling and local energy recovery possible. Specifically, Canon toner particles and plastic toner containers contain zero hazardous materials and are therefore acceptable at local recycling and local energy recovery facilities. Environmental impacts associated with transportation of containers are reduced as a result of these local options. SOS believes that everyone has the responsibility to protect our environment so that future generations may have a better quality of life. 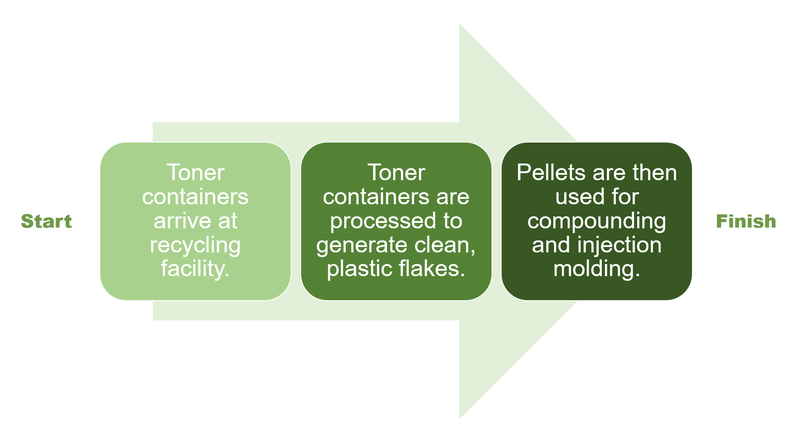 Want to learn more about recycling your copier and printer consumables? "Sharp's dedication to environmental stewarship is a long standing corproate core value that's demonstrated in our products and our business activities, not a response to the latest trends." "For over a quarter of a century, Kyocera has been manufacturing products that are as friendly to the office environment as they are to the global environment." "KIP is committed to product designs that promote environmentalhealth & sustainability. Our goal is to consistently improve and refine the technologies in KIP products that keeps our planet green."